When Howard Carter shows the class his "cursed'" marble straight from King Tut's tomb, Jake feels a bit uneasy. He starts feeling even more uneasy when Howard gives the marble to him for Christmas with the warning that he'll be cursed if he doesn't return it. But Jake finds an unlikely friend in Herman Henderson, the town undertaker, who helps him to realize that there are no real curses, including death. 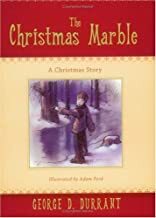 In this sweet story full of endearing characters, author George Durrant offers intense, fresh feelings of love and loss as seen through the eyes of a fifth-grader.